When I stood up during my first playthrough of What Remains of Edith Finch to refill my water, I realized something; my house is full of stuff. There’s the signed poster hanging in my den, commemorating my first trip to Gamescom, the old martial arts belts that add a bit of color to my closet, and there are the half-filled notebooks scattered around my oversized desk. I found myself, still entranced by What Remains of Edith Finch, looking through all these things and reliving the scraps of memories that they represent. Life is chronicled by the little things that we keep in our homes, like the tiny chunk of meteorite I bought with my first ever paycheque. What Remains of Edith Finch celebrates those little things, and what they mean when they are all that remain of us. By now you may have noticed that I’m doing my best to not discuss What Remains of Edith Finch, we’re 150 words in and I haven’t mentioned anything about the game. In fact, I’ve barely described the atmosphere of the game, apart from the vague adventure it inspired through my cluttered little flat. That’s because I don’t want to tell you about this particular game. Okay, I’ll tell you a little, but from beginning to end this is a game that should be savored, unspoiled. It can be consumed in one sitting if you have a free couple of hours and I highly recommend it. 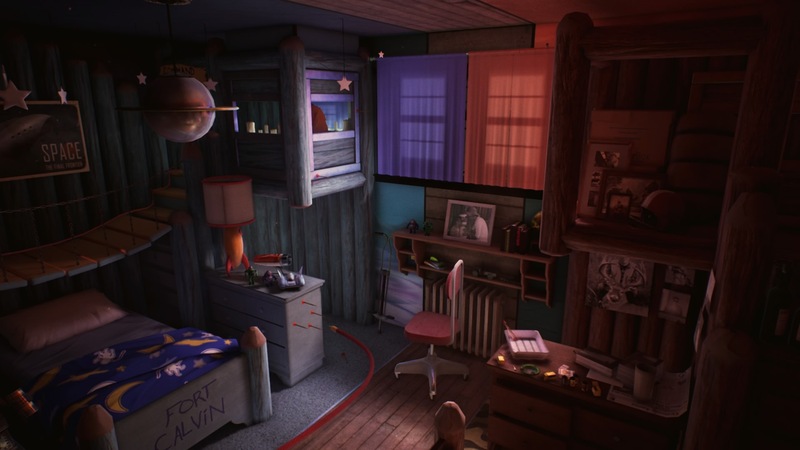 What Remains of Edith Finch is about a house, a family, and how we remember each other. You play as Edith Finch, exploring her long-abandoned ancestral home. Generations of her family and lived and died in this house, you quickly discover as you meander through the corridors and bedrooms that make up this ascetic home. The detail is amazing. The home is filled with life. Some games (and some homes for that matter) look as if the owners have recently suffered a flood. Furniture is scarce and the rooms are open and barren. It looks as if no one has ever lived there. Not so in Edith Finch. The home is crowded with memories and mementos. You’ll pick your way through kitchens, living rooms and bedrooms almost literally stuffed to the rafters. It’s a beautiful, thrilling and heartbreaking journey as you ascend the house, glimpsing fragments of lives that seem so fulfilled, and that’s because the Finch family bear a curse, and every member is destined to die someday. But so is everyone, and the beauty of Edith Finch is that exploration of a life lost, and its effect on everyone else. Despite the size of the house, its sprawling passageways and extensions, it is a small space and the story of each passing rolls into the next. 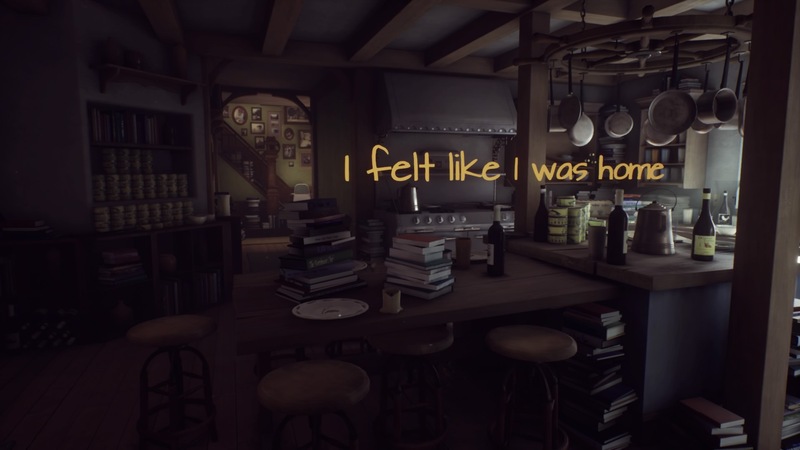 As Edith Finch, you get to experience this, collecting memories and memorials of your ancestors you relive their final moments through expert narration and visual poetry. Each story is different, with decades between the first inhabitants of the house and the last. It can be overwhelming at times because there feels like a truth to the game that no other digital media has quite yet realized. We are here because we love video games, and there is so much they can do. That being said, video games only ever offer three variations of death. They are either a punishment for the player, a singular plot point to process the narrative or a method of removing an obstacle. Death is video games is immediate and temporary. We rarely get to see the long-term effects of loss. Edith Finch shows us those effects. We see one tragedy bring a family together and another tear it apart. You see lives falter and stumble and move on from the death of a loved one. Because that is what actually happens. While most families don’t preserve the rooms of the deceased in quite the same way, the rambling architecture is a near perfect representation of the memories of the Finch family. Rather than repurposing rooms over time, we see each bedroom enshrined to the family member who once slept there. Eventually, the rooms themselves were sealed up and new rooms had to be added to accommodate the later generations. You find yourself raising through the family tree as you move from the solid foundations are the beginning to the precarious structures raised above at the end. And the colors are divine. The way the day slowly wanes into the night while the house and its many stories remain warm and inviting. 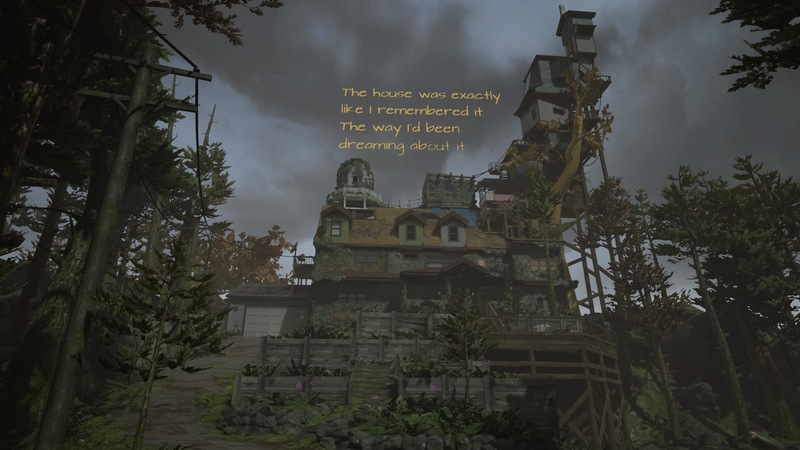 Giant Sparrow have managed to create a true home in Edith Finch, a believable, impossible, welcoming space filled with living memories. This is as close to a perfect story as I can imagine, and it is brilliantly executed. Narration pops up as you explore, refocusing the camera as the words linger on the screen, contextualizing the visual cues all around you. The voice acting and writing is faultless, with each character carrying their own distinct tone through the interwoven stories. I cannot recommend What Remains of Edith Finch enough; even when the stories hit close to home, when you see yourself, or someone you love amongst the faces of the Finch family cemetery. There is heartbreak in this game, and there are positives, outlooks on the world that can only come from those that have felt grief and sadness. No matter who you are, there is something for you here, someone for you. And even if it doesn’t make sense straight away, even if you’ve led a blessed life and never had to experience the anguish of seeing a truly empty room before, you will find this game remains with you for a long time to come. What Remains of Edith Finch has raised the bar for interactive stories and visual storytelling. The impact of static objects, while the story is beautiful and heartbreaking. This, like the Finch family members, cannot be improved, merely built upon and remembered.